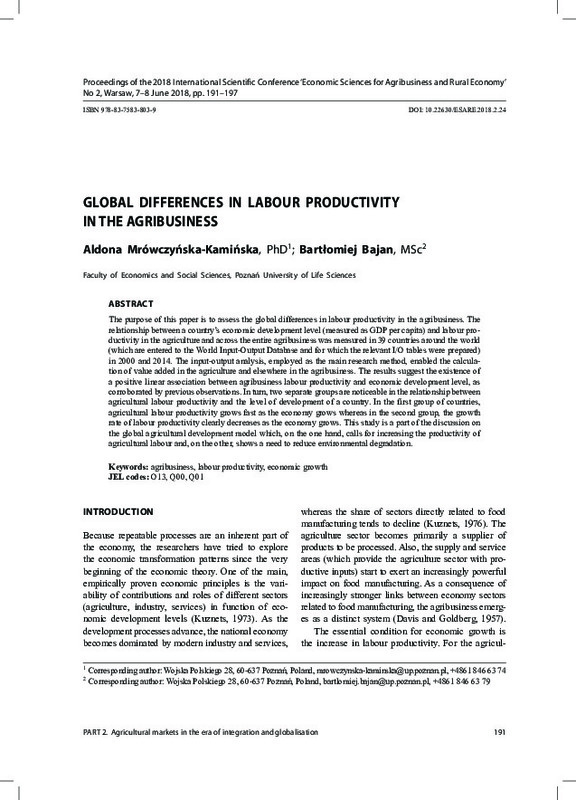 The purpose of this paper is to assess the global differences in labour productivity in the agribusiness. The relationship between a country’s economic development level (measured as GDP per capita) and labour productivity in the agriculture and across the entire agribusiness was measured in 39 countries around the world (which are entered to the World Input-Output Database and for which the relevant I/O tables were prepared) in 2000 and 2014. The input-output analysis, employed as the main research method, enabled the calculation of value added in the agriculture and elsewhere in the agribusiness. The results suggest the existence of a positive linear association between agribusiness labour productivity and economic development level, as corroborated by previous observations. In turn, two separate groups are noticeable in the relationship between agricultural labour productivity and the level of development of a country. In the first group of countries, agricultural labour productivity grows fast as the economy grows whereas in the second group, the growth rate of labour productivity clearly decreases as the economy grows. This study is a part of the discussion on the global agricultural development model which, on the one hand, calls for increasing the productivity of agricultural labour and, on the other, shows a need to reduce environmental degradation.